Hundreds of plants will help a stream in the Book Cliffs Roadless Area. I TOOK MY FIRST pack trip with horses three years ago, and since then, I have been hooked on this great way to see remote areas. Last summer, I went on 12 trips in three states. In southeastern Utah, we don’t have a lot of high country that’s suitable for good horse-packing trips, but we do have one unique opportunity: the Book Cliffs, Little Creek roadless area. The visual appeal of this area is breathtaking. You look up to see sandstone cliffs with aspen trees growing between each cliff band. The small creeks hold cutthroat trout, and the meadows are home to deer and elk. Songbirds are everywhere — singing from every tree. 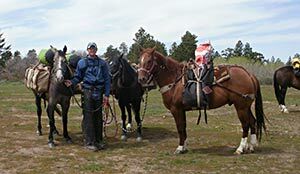 Bart Kettle with pack horses ready to pack the plants and gear into the roadless area. 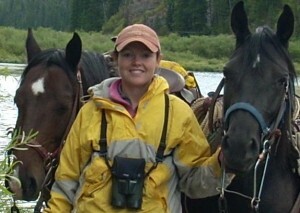 The author, Nicole Nielson, with a couple of pack horses. Despite its beauty, this area is missing one key thing: properly functioning riparian zones (creek bottoms) full of willows and beaver dams. With the right vegetation, riparian areas provide ideal habitat for many species of wildlife. Willows stabilize stream banks and create shade that cools the water. This provides better habitat for fish, which need cooler water to thrive during the hot summer months. The willows also provide plentiful nesting habitat for songbirds and serve as forage for deer and elk. Insects are abundant in riparian areas, which benefits both the songbirds and the fish that feed on them regularly. If there were still beavers in this area, they would eat some of the willows and use them to build dams. Multiple beaver dams within a drainage can hold water during spring runoff and slowly release the water all summer. A slower release of water reduces erosion and benefits downstream systems. I have a personal interest in this area, and I also needed service hours after re-enrolling in Utah’s Dedicated Hunter Program. So, I proposed a planting project that would do two things: improve the riparian areas to benefit multiple species and restore the function of the stream. A friend of mine has horses and packing equipment, so we decided to pack in plants and begin restoring a small section of the creek. We packed in 205 plants, including red osier dogwood, water birch, aspen, chokecherry, golden currant, yellow willow and whiplash willow. With five horses ready to go — and three of them packing the plants, equipment and gear for a three-day stay — we were off. Bart Kettle with willow cuttings ready to be transplanted. Packing hundreds of plants down a horse trail, without them getting beaten up and broken, was a real challenge. We used grain bags to cover the plants and hoped for the best. Fortunately, it worked — the plants looked great when we arrived at the planting site. 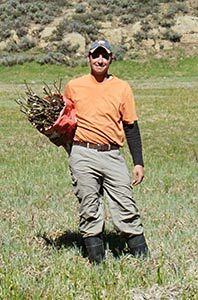 Within three days, we planted the 205 plants we packed in, and we also planted approximately 800 willow stem cuttings. We used hand pruners to cut the stems from existing willow plants and then quickly placed them in the wet mud next to the creek. As long as the stem is moist, it will grow roots and become a mature plant. Because this was a small project, we worried that deer and elk would eat all of our hard work. So we cut some of the burnt conifer trees in the area and built small exclosures around some of the plants. The exclosures will hopefully prevent deer and elk from eating the new plants until they can establish roots and grow large enough to withstand browsing. In the future, I would like to return to this area and continue planting. As the upper portions of the stream become more functional and hold water during flash flood events, more transplanting could occur on the lower portions of the stream. This article is great. Have you returned to the area? Did the plants survive? What do they look like now? Please give us an update. Glad I found this article. Hopefully, you can do more of this. Sounds like something I would like to be involved in.